PALS(Portsmouth Area Ladies, Inc.)Purse Bingo Party Committee members examining some of this year’s designer purses to be awarded as prizes on March 17 are (back row, left to right: Tess Midkiff, Diana Wellman, Carol Davis and Debbie Gambill; front, left to right: Gail Miller and Jill Arnzen). PALS (Portsmouth Area Ladies, Inc.) will offer area women “the luck of the Irish” at its Purse Bingo Party on St. Patrick’s Day, March 17, at the SOMC Friends Center, 1202 18th Street in Portsmouth. Highlighted by a colorful array of designer handbags as the “pot of gold”, the fundraiser will begin at 2 p.m. and feature 15 games of bingo with a designer purse to be awarded every game. Doors will open at 1 p.m. Gina Collinsworth will serve as master of ceremonies for the event. Guests must be 18 years old to participate in the bingo games. Big attractions for the afternoon of fun and entertainment will be purses by famous fashion designers such as Coach, Kate Spade, Michael Kors, Brahmin, Dooney and Bourke and Gianibernini. Doors prizes will give guests opportunities to win other kinds of purses as well as attractive items from numerous vendors. “Lucky” prizes will also include a Chinese Auction of “gently used purses” and the raffle of a “cash money tree” valued at $500. Raffle tickets, available from PALS members and the PALS’ website, are priced at $5 for one ticket and 5 tickets for $20. A concession stand will offer refreshments for sale and Split the Pot chances will be sold. each. Ticket sales will be limited to 400 for the event. More details may be obtained by calling (740) 821-1191 or by contacting ticket chairwomen Linda Woods Jones at (740) 935-1062. Sponsorships for the benefit fundraiser are also available. $500 sponsorships will include 8 reserved seats, $250 sponsorships include 4 reserved seats and $100 sponsorships include 2 reserved seats. All proceeds from the PALS Purse Bingo Party will go to help nonprofit community causes and needs. 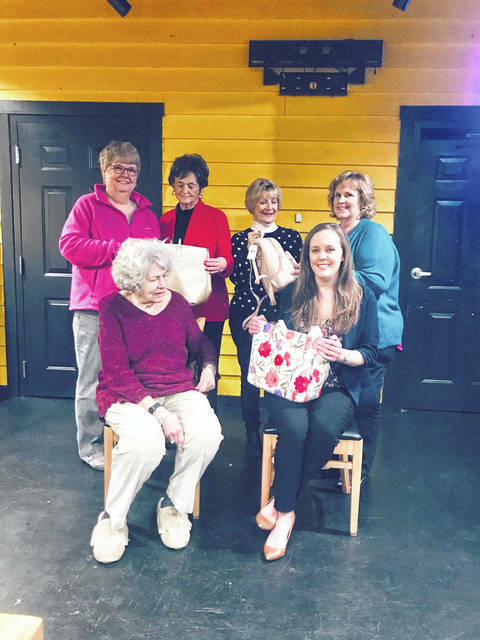 A volunteer group of women who work to support charitable needs and organizations that will improve the quality of life in the local area, PALS has given more than $90,000 to community causes since the group was founded in 2007. Through a grant application process, the group uses funds raised each year to support nonprofit organizations with a wide variety of concerns including Scioto County food pantries, Counseling Center drug and rehabilitation programs, Southern Ohio Medical Center projects, the Ohio Valley American Red Cross, Scioto County Children’s Services, cystic fibrosis, autism and Area Agency on Aging, to other nonprofits like the Portsmouth Area Arts Council, the Portsmouth Public Library, the Southern Ohio Museum’s Cirque d’Art Theatre, SOMC’s Hospice campaign, Friends of Greenlawn Cemetery and many more. In 2016 PALS also collaborated with the Portsmouth Bicentennial Committee on the painting of a new Portsmouth Welcome sign on the floodwall. assist with her college costs each year. PALS uses a portion of their fundraising proceeds to build the scholarship fund so that it will be able to continue to help area youth in the future. Additional information about the party and photographs of the purses can be found at www.facebook.com/PortsmouthAreaLadies under PALSPURSEBINGO and on the PALS website at www.portsmouthpals.org.